Taylor grew up in the northern suburbs of Chicago with her mom (Randy), dad (Sandy), sister (Shelby), and brother (Blake). As a child, Taylor loved performing and taking yearly trips to Sarasota, Florida...where Scott is from! Taylor attended college at Emory University, where the two met. Since graduation, she has resided in Washington, DC. She spent her first two years out of college working at Children's National Medical Center as a Child Psychiatric Specialist in the inpatient adolescent psychiatry unit. She is currently in her first year of graduate school at The George Washington University working on her doctorate degree in clinical psychology. Taylor hopes to someday work as a child, adolescent, and family clinical psychologist, teach psychology at a university, and raise a really big family! In her spare time, she loves traveling, being very girly, and spending time with family, friends, and of course Scott! Scott grew up in Sarasota, Florida with his mom (Joan), dad (Brad), and two older sisters (Emily and Michelle). As a kid, Scott spent much of his time playing sports and at the beach. After graduating from high school, Scott moved to Atlanta where he studied at Emory with Taylor! For some reason, Scott majored in Anthropology, but after realizing he didn’'t have a career analyzing the fossil record, he focused his attention on pursing a career in sports, —not as an athlete, clearly (vertical limitations). Scott has since been working in the Legal Department at the NFL Players Association and just graduated from Georgetown University Law Center. 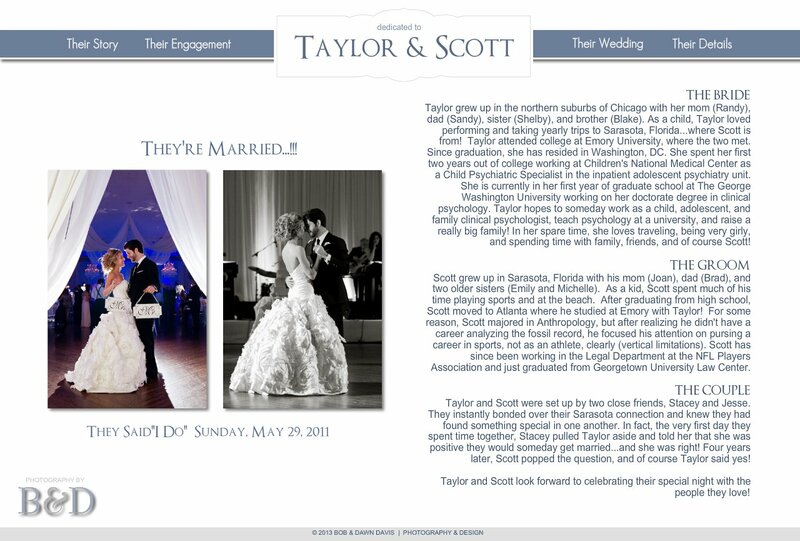 Taylor and Scott were set up by two close friends, Stacey and Jesse. They instantly bonded over their Sarasota connection and knew they had found something special in one another. In fact, the very first day they spent time together, Stacey pulled Taylor aside and told her that she was positive they would someday get married...and she was right! Four years later, Scott popped the question, and of course Taylor said yes! Taylor and Scott look forward to celebrating their special night with the people they love!